Well-known pharmacist Mark Dunn FPS has won the Tasmanian Pharmacy Lifetime Achievement Award announced in Tasmania on Saturday, November 12. Mr Dunn was honoured – along with several other leading Tasmanian pharmacists – at the Tasmanian Pharmacist Dinner at the Glen Albyn Estate in Hobart. Other winners included Tasmanian Pharmacist of the Year Susan Lee, from the Valley Road Pharmacy in Devonport, and Rebecca Wyatt who won the 2016 Early Career Pharmacist Award (posthumously nominated). In a show of collaboration, PSA, the Pharmacy Guild of Australia, the Society of Hospital Pharmacists Australia (SHPA) and University of Tasmania, Pharmacy Department all worked together to host the third awards night and celebratory dinner. PSA Tasmania President Ella Van Tienen said the Awards highlighted the spirit of cooperation within the profession and rewarded outstanding pharmacists. Ms Van Tienen congratulated Mr Dunn, saying he was highly respected as an innovator in the pharmacy profession. “As the former owner of Australia’s southern-most pharmacy in Dover, Mr Dunn has experienced the professional isolation of a rural pharmacist. To help overcome the tyranny of distance, Mark embraced emerging technologies and established AusPharmList to support pharmacists,” Ms Van Tienen said. SHPA Tasmania Chair Duncan McKenzie said Ms Wyatt, from Launceston General Hospital, was posthumously named Early Career Pharmacist Award winner. Her Award was accepted by her parents Christine and Chris Wyatt. “Rebecca – who sadly passed away earlier this year – was profoundly involved in Tasmania’s pharmacy profession. As a pharmacy student, she was the TAPS President and an active SHPA member. She later became a specialist ICU pharmacist and medical team leader actively involved in the education of others,” Mr McKenzie said. Pharmacy Guild of Australia Tasmanian Director Greg Luckman said Ms Lee’s professionalism to her customers and humanity enabled her to win Tasmanian Pharmacist of the Year. “Susan is an excellent mentor and role model for any pharmacist who works or wants to work in the profession. Her morale within the workplace shines and it can be attributed to the wonderful, encouraging person who not just owns the pharmacy, but works alongside her staff,” Mr Luckman said. In a separate ceremony, Laura Perry received the PSA Tasmanian Intern of the Year Award for 2016. She works as an intern pharmacist at Mersey Community Hospital. Ms Perry received a MIMS $2000 grant to attend PSA17 in Sydney. A comprehensive new education program and value-adding resources to support pharmacists working in general practice have been launched by the peak national body for pharmacists, the Pharmaceutical Society of Australia (PSA). PSA National President Joe Demarte said as the single largest provider of quality education for pharmacists in Australia, PSA has developed the education program called the General Practice Pharmacist Fundamentals. “The innovative, online course will provide expert guidance to pharmacists interested in this important area of practice,” Mr Demarte said. “The course is backed by a suite of practice tools to help pharmacists tailor their services to the needs of the local community. These evidence-based tools have been developed by experts in the field, peer-reviewed and tested by pharmacists already working in general practice. Mr Demarte said he was delighted the new tools and resources more than meet the identified needs of pharmacists working in general practice, as recommended in the UTS evaluation of a recent pilot project at WentWest Primary Health Network (PHN). “PSA has been leading this exciting professional development and is happy to see many years of advocacy and positive stakeholder relationships culminate in a collaborative model of care that has widespread support across Australia’s healthcare community,” Mr Demarte said. Mr Demarte said while PSA strongly supported Australia’s community pharmacy network, the organisation believes the GP-pharmacist model will enhance integration of pharmacists and community pharmacies within the primary healthcare setting. “PSA strongly believes that a viable and robust community pharmacy network is necessary to achieve quality use of medicines for consumers, but quality healthcare does not happen in isolation,” Mr Demarte said. “A flexible GP-pharmacist model will enhance integration of pharmacists and community pharmacies within the primary healthcare setting to ensure alignment and better coordination of services. A new document addressing concerns about integrating pharmacists into GP practices with evidence-based facts has been launched by the peak national body for pharmacists, the Pharmaceutical Society of Australia (PSA). 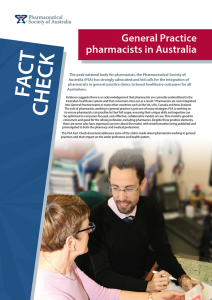 The Fact Check document (click on image below for larger view) – which is supported by local and international evidence – outlines the wide-ranging benefits of integrating pharmacists in a GP environment as part of an interprofessional team. Mr Demarte said PSA has led the GP-pharmacist model in Australia following many years of advocacy and positive stakeholder relationships culminating in a collaborative model of care that has widespread support across Australia’s healthcare community. The latest University of Technology Sydney (UTS) Pharmacy Barometer released this week also showed pharmacists working in a medical practice were supported by 49% of pharmacy owners/owner managers, 63% of pharmacy managers/pharmacists-in-charge and 80% of employed pharmacists. “Despite this strong support, misinformation is being spread about pharmacists working in General Practices and their impact on the wider profession and health system and PSA would like to address these misconceptions,” Mr Demarte said. “Let’s be very clear that PSA strongly supports Australia’s community pharmacy network, as evidenced by our numerous policy positions, submissions and advocacy activities as well as our investment in the Health Destination program, an initiative designed to improve the viability and sustainability of pharmacies. “We also support the role of pharmacists working in general practices and see the two roles as complementary, not in opposition to one another. A flexible GP-pharmacist model will enhance integration of pharmacists and community pharmacies within the primary healthcare setting to ensure alignment and better coordination of services. This model is all about optimising the contribution of pharmacists and pharmacies, for the benefit of consumers. Mr Demarte urged the Federal Government to move ahead with their desire for a trial of integrating pharmacists in GP clinics. Applications are now open for the 2017 ignite leadership program run by the peak national body for pharmacists, the Pharmaceutical Society of Australia (PSA). ignite aims to nurture high-performing Early Career Pharmacists (ECP) into future leaders who will drive strategy, change and innovation. PSA’s eight-month education program combines interactive workshops, inspirational speakers, networking opportunities, personal mentoring and a practical workplace project. 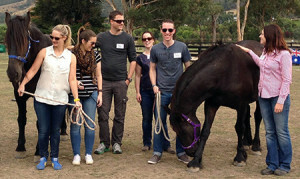 As a unique benefit, ignite participants have the chance to develop leadership and teamwork skills while working with horses. PSA National Vice President Michelle Lynch said the ignite program enabled passionate young pharmacists to reach their leadership potential in an ever-changing pharmacy landscape that continues to face challenges. “To ensure the integrity and robustness of the profession is maintained, and pharmacists continue to evolve and adapt to meet the needs of the community, we must equip young pharmacists with the skills to manage change and spark innovation,” Ms Lynch said. Participants complete nationally-accredited units in the PSA Graduate Diploma of Applied Pharmacy Practice and the PSA Diploma of Leadership and Management. Whether pharmacists wish to advance their career within a hospital, community, industry, government, non-government or academic setting, the ignite program provides the platform they need to succeed. “ignite gives ECPs the tools and training they need to take the next step in their career,” Ms Lynch said. All PSA members and ECPs, preferably in a management position, can apply now through PSA’s website. More than 240,000 Continuing Professional Development (CPD) assessments were completed by members during the 2015-16 CPD year, according to the latest statistics by the peak national body for pharmacists, the PSA. This trend reinforced that PSA is the single largest provider of quality CPD, education and practice support for pharmacists in Australia. With more than 250 online activities available anywhere and anytime, PSA supported members to complete 126,000 assessments through PSA’s award winning journal Australian Pharmacist and 33,000 assessments during face-to-face events. The PSA also received overwhelmingly strong support for its pioneering and intuitive CPD Planning Tool, which allows all PSA members to maintain their competence and meet the Pharmacy Board of Australia’s CPD registration requirements. The CPD Planning Tool has been supported by a popular national roadshow featuring 113 workshops recently attended by around 3,000 pharmacists across the country. PSA National Vice President Michelle Lynch said these results and statistics reinforced PSA as the leading provider of high quality and evidence-based education and practice support. “PSA is the ‘go-to’ organisation for developing pharmacy careers, assisting pharmacists to advance their practice to improve health outcomes of our patients and the community,” Ms Lynch said. The PSA also received a surge in website traffic in the lead up to the end of the CPD period with a record 3,700 sessions and 23,000 page views just before the CPD deadline of September 30. “These already strong engagement figures are set to increase in the new CPD period with PSA offering even more topical and targeted content to support the lifelong learning of all pharmacists,” Ms Lynch said. PSA Executive Director, Practice Support and Education Jan Ridd said all PSA education is underpinned by an extensive range of practice support resources including professional standards, guidelines, protocols and implementation tools. “The range of CPD activities – including events, online modules, live broadcasts, recorded lectures and distance-based education – caters for all learning styles and career stages, allowing pharmacists to undertake relevant CPD in the format that suits them,” Ms Ridd said.